Five years ago in February 2011, I was posting about a 2011 Winter Fellowship Issue from Tschipey Achtu Lodge. I received a copy of this patch from several folk, the first to report it was Mark Spezzano. 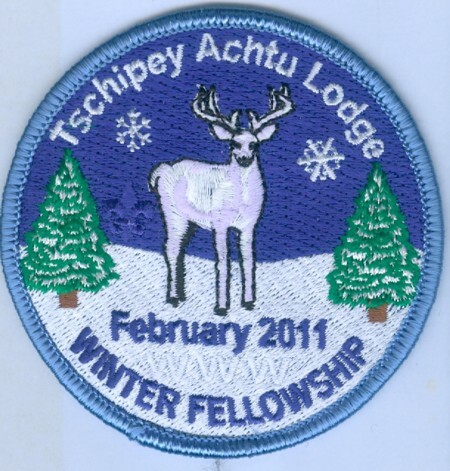 A new event patch from Tschipey Achtu Lodge #397 which was issued for their Winter Fellowship which was just held this weekend. There has been some controversy over the use of a lodge number. At one time the lodge website reflected 397 (the council number) as the number used by the lodge, but this reference has since disappeared. I was told verbally by a professional in the council that the Scout Executive said the Lodge number was #95. I’ve been told by other volunteers that if any number is used it should be #397. So what to do. Until the updated Blue Book settles on a numbering convention for these situations, I believe I will use #(95). the lowest number of the predecessor lodges in parenthesis, a convention used for lodges who have not chosen a lodge number and to avoid conusion with the active Louisiana lodge Chilantakoba #397. I don’t plan to go back and edit the previous posts, but will use (95) going forward.